In what could be a new high water mark of anti-Washington sentiment, the city of Troy, Mich., is rejecting a long-planned transportation center whose construction would have been fully financed with federal stimulus money. The street signs at the city's entrances say "City of Tomorrow, Today!" but it sounds like Mayor Daniels is leading Troy backwards, with great conviction. The owner of Saab Automobile finally threw in the towel Monday, filing for bankruptcy after hopes of a life-saving investment from Chinese investors collapsed in the face of opposition from General Motors. This creates a dilemma for those of us who feel a professional obligation to uphold the stereotype of the Swedish-car driving college professor, but believe we are too cool for Volvos. The Economist's "Schumpeter" column gave a the brand a nice (though slightly premautre) obituary in September. It is still possible someone will buy the company whole in bankruptcy and restart it, but most reports suggest liquidation is more likely. The story itself is fine, though the "but" in the headline suggests that the editor who wrote it expected austerity to lead to (short-term) growth. Most of us economists don't find the coincidence of fiscal tightening and slumping growth so surprising (see e.g., Krugman). Last week's summit agreement to tighten enforcement of the budget rules in the "stability and growth pact" doesn't help matters. One is reminded of the old joke that the Holy Roman Empire was "neither Holy, nor Roman, nor an Empire." I suppose actually enforcing the rules would make it more of a "pact," but forcing procyclical fiscal policies won't be good for stability or growth (see this post by Antonio Fatas). So its not surprising that the Washington Post reports "In Europe, summit optimism fades." The half-life of "summit optimism" seems to be declining, which means that Europe must either (a) really fix things or (b) hold summits more frequently. I think they're converging towards continuous summit. 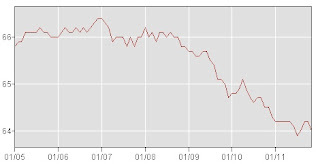 The employment growth number comes from a survey of businesses (the "establishment survey") while the unemployment rate is calculated from a household survey (which has a smaller sample). Continuing a recent pattern, employment growth looks better in the household survey: 278,000 more people said they were employed. Also continuing the pattern of recent reports, the previous establishment survey numbers were revised upwards; September's job gain is now 58,000 higher and October's is up by 20,000. Over the past several months, the revisions have been bringing the establishment report figures up closer to the better household survey numbers (which aren't subject to revisions). 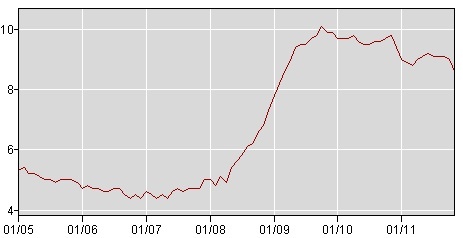 By itself, 278,000 more people employed doesn't get the unemployment rate down by 0.4 percentage points. 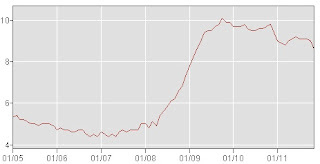 The labor force fell by 315,000 (thus bringing the participation rate down). 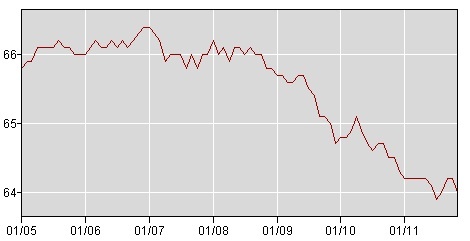 The unemployment rate is measured as a percentage of the labor force, and to be counted in the labor force, someone must either be working or looking for work. Another way of looking at it is that the number of people who were unemployed fell by 594,000 - roughly half of them got jobs, while the other half quit looking. On a non-seasonally adjusted basis, the unemployment rate in November was 8.2% (down from 8.5% in October, mainly due to a big drop in participation) and payrolls rose by 339,000. That is, November is a month when the seasonal adjustment makes things look worse... it will be the opposite in January when all the extra holiday employees lose their jobs.